The first time I ever worked with Gourmet Gift Baskets was in November when I reviewed one of their holiday gift baskets. Until I was approached to do this review and giveaway, I was not aware that they produced fresh baked goods like this delicious assortment of brownies. Their Gourmet Brownie Sampler has six varieties with two each. They include the Peanut Butter Brownie (rich nutty taste merging with chocolate); Cheesecake Brownie (the perfect way to enjoy two dessert tastes in one); Belgian Chocolate Chunk Brownie (hefty pieces of chocolate heightening that scrumptious chocolate flavor even more); Fudge Walnut Brownie (chopped walnuts mingling with chocolate in just the right combination); and the Butterscotch Brownie (buttery smooth enjoyment in each bite); and White Chocolate Macadamia Nut Blondie (white chocolate pieces and nut accent this already great blondie). Once this box of brownies arrived, it did not last very long in my house. My family attacked it like a pack of hungry wolves. Everyone was made to break off pieces so we could all try each flavor. And I must admit that it was difficult to decide which variety tasted the best. To tell the truth, it was a toss up between the Belgian Chocolate Chunk Brownie and Cheesecake Brownie. However, this was our personal favorites–and yours could be different. 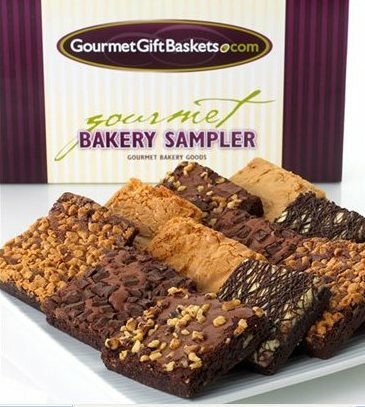 Thanks to Gourmet Gift Baskets, one lucky Nuts 4 Stuff reader in the continental United States wins the same Gourmet Brownie Sampler except with six brownies (one of each flavor). This giveaway ends April 18, 2012 at 12 PM Eastern Standard Time. The winner will need to respond to my email with name and shipping address within 48-hours or another winner will be picked. fyi—i cant read most of the captions..i love the contest,but im blind! "Like" Gourmet Gift Baskets on Facebook (tracy davis hayes). I follow Gourmet Gift Baskets on Facebook under the username likwan. I tweeted the requested message on Twitter at https://twitter.com/#!/likwan/status/192594325748711425.